The biting wind whips and the white light scatters between dusty snow clouds. The ends of the Earth rear up to swallow the soulless legions in endless frost. Their programmed apathy towards frozen joints and long jammed weapons keeps them moving towards destruction on the desolate front lines. An exercise in futility some may call it- others, an elegant symphony of flawless warfare conducted like clockwork. The penguins tremble and flee. The whales beneath drone and creak the ice, forming, in a fashion, a soundtrack for the battles that rage across the frozen wasteland above. Shells land, the booms muffled by gallons of upturned powder. Brief flashes of gold and orange flicker in the distance among the cool shades of tundra. Is courage simply following instructions, persisting till cold metal lays to rest within the ice? There is no heart in the chests of these tin soldiers, only rusted circuitry laden with target acquisition systems. They bleed oil as their worn hydraulics sigh out one last time. When fear of death is absent, what prods this cold soldier onward? Can there really be such a thing as valour among the mechanized masses? Components: Concept art, music, literature, and a pinch of love all strewn together in a Blender and Photoshopp'd to look especially tasty. Please fav and share on your preferred social network! This is absolutely amazing! Great work! I wish I could make pictures like this. 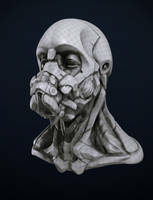 awsome dude, was browsing through the steampunk scearch i did, u were in the middle of fat 3d women. atleast there is a good thing in the scearch. saw them on the forums when they were still WIP and I thought, and I quote, "I'm fucked..."
Man... That is some crazy 3D moddeling skill showcase ! Good work. I love it!!! The detail on this is incredible! Nice job!